Gee19 kindly sent me some houseleeks. I planted them in a circle, and they've now grown lots of little babies ! Hi Janette.. How are you ? That was a quick response ! Thanks. ... you're speedy on the keyboard tonight, too ! Lol. What a beautiful pot of houseleeks, the two colours are just great! Sandra, I'm tempted to put this on GoYpedia Mosaics as well as Houseleeks ! What will you do with all those babies? ~ just what I was thinking Great~ It looks very artistic....I wouldn't mind trying a couple of babies too please? That is a work of art, love it. That's so perfect, it hardly looks real. I love it! So pretty, I love it too. I was wondering what happened to you...but happy to hear that you're feeling better and back on track...all good wishes, regards Waheeda. Ps your garden pics in your recent blog are stunning! need i say anything!!!! you have 31 comments already! Yes please TT and a poem to or am I pushing my luck lol. If any of us manage to grow houseleeks like yours it will be a miracle!!! I'm so pleased the Houseleek babies grew into these pretty patterns .. So beautiful, it reminds me of one of them aswell Sewingkilla. Best bit is i have'nt seen one of them for years..
What can I add to what has already been written!? This is really stunning. This could go into the new Tate Gallery Terratoonie. It's far better than some of the exhibits shown on the tele. Oh this is amazing Tt....looks like a very pretty brooch, a bit prickly mind....just gorgeous! Can I go on the list please, Terra? I'm no good at poetry though - still can't find a rhyme for orange. Ooo TT thanks for that link grandaughter will love it! Hi Linda... Houseleeks at the Tate sounds great ! Lol. Hi again Skilla... on that link, the children can make kaleidoscopes on screen with teddies etc... Lol. TT, thank you so much for putting the photo on again, I was going to ask you to. Sylvia loved it in the blog so now I can add it to my favourites for her. Thanks again, hope you are fully recovered now. Yes I caught up TT, Amy sent a very nice PM today. I'm pleased you've "stolen" my idea Shahida... Lol. How did I miss this beautiful picture, it is amazingly beautiful! Clever plant and photographer !! Very pretty. I did and now i'm jealous. As soon as my geraniums and chelsea flower show special get here from T & M tomorrow i'm off down the garden center. ... and you plan to conceal the Sempervivum under your jumper ...??? ...could be prickly, but worth it to get them home safely.... Lol. I certainly did and it was fabulous. nature is clever with her forms and shapes ..
Wow, that arrangement is beautiful! Just had a look at that link, thats sooooo much fun! Have you been playing kaleidoscopes... ? what can i say - we all love it. I am confused though. 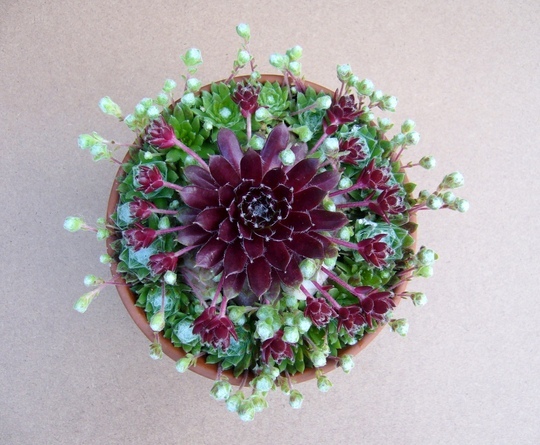 Are plants such as these (have just uploaded some) :- houseleeks, sempevivums, echeviras (mispelt probably) or succulents? The ones I bought had a sempy label but they look like yours. Please soothe my aching brain with your knowledge?? Houseleeks, sempervivums and echeverias are all Succulents..
Terratoonie, I award you the Bornagain's flowerpot award... blah blah blah. I'll soom get tired of this. beautiful if iam your neighbour i would have stolen it. ... steal my pot of houseleeks ! ... if you were my neighbour, I would give you lots of houseleeks so that you could plant them and make your own mosaic patterns ! How are the houseleeks doing after our long winter, Terra? I have some houseleeks that are desperate for replanting and I'm thinking of putting them in two small wall planters that our daughter brought me home from their recent holiday in Spain. You say they need little water so maybe that's what is up with my Sempervivums as I may have overwatered them (they have quite brittle brown/dead leaves around about the individual plants). I will have to make sure they have drainage in the pots and hope for the best. The other day, I took a photo of the "grown mosaic" ..
Well I'll see if I can get some planted in my wall planters once I have them hung up...haven't decided on a location yet...waiting til the borders and turf are in. Ta, Terra. Thank you Terra....the garden lady and her team are to start on Tuesday/Wednesday :) Full steam ahead. how beautifully symmetrical - shows that nature knows best when left simple - of course the gardener has a lot to do with that as well! A simple design on the face of it, yet intricate in detail, not showy, not "look at me!" but quietly and beautifully satisfying. I must have a go at that - it looks great, TT. Yes, I'm very late finding it. Hard to keep up on here! Hi Crissue, not 'seen' you for a while. Hope life in France is good. Yes, it's probably time for an update, TT. Stunning photo, love it! I'm a big houseleek fan but have never managed to grow anything as lovely as this! Lovely photo wish mine would grow like that probably I should keep it sheltered in the winter-- but this is really nice.